Dr Nick Gordon looks at the financial complexities of the Venice Biennale. Controversy broke out last year between the Australia Council and a number of the private patrons of Australia’s participation at the Venice Biennale. The Australia Council had introduced significant changes to the selection process. This would see it take a more active role in the selection of artists through an application process, rather than delegating selection to a committee in consultation with its patrons. Part of the outrage expressed by some of Australia’s most eminent patrons came from a sense of betrayal: they had not been consulted, and the expectation seemed to be that they would continue their patronage with limited involvement. One director was quoted in the Sydney Morning Herald: “It is inconceivable that they did not think they should have at least a conversation with the likes of Simon Mordant and Neil Balnaves [two of the largest benefactors] and various others.” Mordant himself said that he “was particularly shocked and dismayed that there’d been no consultation,” and was reported to have said that he would withdraw his support for the 2019 Biennale. While the issue has passed – and at no point led to serious public questioning of the quality of Australia’s artists – it highlights some of the difficult relationships at play between governments, commercial galleries and artists. Behind the controversy was a directive issued by the Venice Biennale Council. The directive was alluded to in the coverage but received little attention, and it is now hidden away in the rulebook for participating nations. As a condition of their participation in the Biennale, nations must now have a transparent selection process, administered by a state-run organisation. So what triggered this change in the rules? In 2015, a scandal broke out about the number of Chinese artists selected for the Kenya Pavilion. Previously, in 2013, 10 of the 12 artists in the Kenya Pavilion had been Italian or Chinese nationals. Just who was involved and exactly how is shrouded in the murky relationship between money, ulterior motivations and the selection of artists. 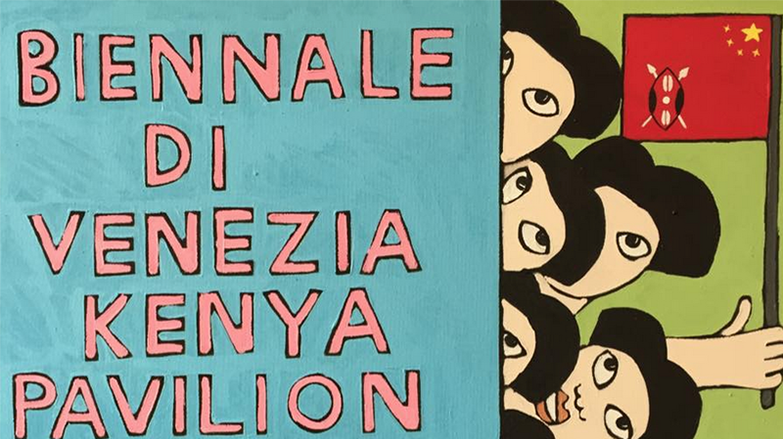 The Kenyan government was petitioned by Kenyan artists, and subsequently denounced the exhibition, forbidding it to use the Biennale logo or any symbol of association with Kenya. China and Italy do not seem to have been involved: both countries already have exceptionally large pavilions and other legitimate avenues for showing off the national talent. The Financial Times suggests it is at least partly down to Yu Lugen – a Nanjing-based real estate mogul. Lugen has one of the largest private collections in China and seeks to build China’s largest art-business by 2020. He seems to attract controversy, and once staged a large Anselm Kiefer exhibition in China, which Kiefer denounced, and a touring Van Gogh exhibition with no works by Van Gogh. While Lugen has a true passion for art, he also admits his financial interests in it. On the other hand, the Venice Biennale Committee understands the history of the world’s premier art event. The Biennale was created in the 1890s with some sharp commercial acumen – Venice would pay to ship works of art by leading artists to Venice, in exchange for a cut of the sales and the tourism income generated in the city. In the 1950s and 60s, however, the Biennale transformed into what it is today: a non-commercial art event encouraging competition and facilitating cultural exchanges between nations and artistic traditions. Participation is now limited to nations (including some stateless ones), NGOs and not-for-profit galleries. In this regard, the credibility of the Biennale after World War II relies on its reputation for showcasing the best art from around the world for altruistic, rather than commercial, purposes. This shift has been accentuated in the 21st century, as is apparent in the increasingly wide representation of nations from Africa, Asia, the Middle East and South America – a reflection of the capacity of globalisation to increase intellectual and artistic interconnectedness. Unlike commercially driven art fairs, such as Art Basel and Frieze, the Biennale offers up an essentially non-mercantile international exhibition. This is part of how the oldest and most prestigious biennale differentiates itself from the proliferation of biennales and art fairs around the world. The credibility of the Venice Biennale, however, requires participating organisations to select works based on lasting artistic value rather than commercial interest. Generally, they do so. And yet the art industry is a curious economic hothouse, with quite extraordinary sums of money involved in the creation, sale, display, distribution and insurance of art. Sometimes the demands of the industry’s scions – those who trade in art, rather than make it – lead to phenomena recognisable from other industries. Zombie Formalism, for example – a rather uninteresting neo-expressionism – rose and fell between the early 2000s and the mid-2010s with the familiar pattern of a bubble, in which a sudden surge in demand for a type of art led to the quick production of works for galleries and buyers to flip, only to have the prices collapse and the art written off as bad investments. In an essay for Artneton the movement and the rise of “Debt Aesthetics”, the artist and writer Chris Wiley reported that one such flipper, Niels Kantor, bought two works by prominent Zombie Formalist Hugh Scott-Douglas for 100,000 USD each … only to have them sell at auction two years later for less than 25,000 USD. Caveat emptor, perhaps. Selection committees for the Biennale usually avoid such embarrassment by favouring artists with a long track record. But here too, the commercial imperatives of the art industry are potentially at work. In 2014, as Julia Halperin reported in The Art Newspaper, just five commercial galleries represented 30% of all solo shows at 68 major museums in the USA. Between 2007-2014, those same five galleries had supplied 11 of the 12 artists with major solo exhibitions at New York’s Guggenheim, 45% of MoMA’s, and 40% of LA’s Museum of Contemporary Arts. A handful of commercial galleries are much more able to advance their interests than others, and doing so has raised questions about the extent to which they have come to direct the agendas of major museums. Who’s in the museum shapes public perception of contemporary art, and increases the value of an artists work by granting them legitimacy and public recognition. Similar patterns have been reported in Australia, most frequently by John Kelly, artist, critic and Walkley award-winning journalist. As Kelly points out, Roslyn Oxley9 has represented seven artists at the Australia Pavilion at the Biennale since 2003, and represents three of the past four solo exhibitors. Kelly’s concern is less for the quality of the art than it is for what lies behind the choices made. Rosyln Oxley9 is one of Australia’s most influential contemporary galleries, but its dominance at the Venice Biennale is, according to Kelly, one aspect of a broader problem in the selection process that he attributes to “myopia”, rather than impropriety, among Australia’s arts leaders. Kelly has his own critics, and the selection process has changed. The sense of outrage at the manner in which a statutory body altered its internal processes to conform to the new rules suggests that investment in the Biennale is as personal as it is fiscal. Not many countries are known for their extensive public funding of the arts, and Australian art’s improved reputation abroad has been made possible through public-private partnership (and some damned fine artists). But it is also essential that the rules change from time to time, so that new practices are effectively constrained. Exactly how some businessmen were involved in the strange selections made for the Kenya Pavilion remains unknown; the ‘selection’ was too diplomatically daft to suggest involvement from the businessmen’s state of origin. Doing so maintains the strength of Venice Biennale as the pre-eminent venue for representing the diversity of contemporary art, artists and their visions. It would provide far less to the public if commercial or political interests overrode the intangible value of art that people seek. Dr Nick Gordon is a cultural historian and artist, with over 10 years of experience leading tours to Europe. He has strong interests in art, history, philosophy and architecture, from the ancient world to the present. Nick is also a practicing painter and brings this passion to the visual arts. He holds a University Medal and PhD in history from the University of Sydney. There’s more to the respected Dutch city than canals, cannabis and scantily clad ladies. The landmark exhibition will be the first solo show by an Indigenous artist at the prestigious international event.